2019 is a big year for Holts. Why? Because it marks a century since our founder, Douglas Holt, launched what would go on to become an international car maintenance brand. That’s 100 happy years helping motorists to keep on running – and we couldn’t be prouder of everything we’ve achieved. Since Holts was established in 1919, a lot has changed in the world of motoring. From the growth of car ownership after the First World War to the development of modern hybrids and electric motors, the cars we drive have changed massively – but we’ve always been there to help drivers get from A to B with as little stress as possible. So, whether you’re a new driver or have been using our products for decades, join us as we celebrate 100 years of Holts’ heritage and know-how. We’re taking a look at the early days of our brand, a handful of our most iconic car maintenance products, and what the future holds for one of Britain’s favourite car maintenance specialists. Holts is one of the most recognisable names in car maintenance, with millions of motorists trusting our products to take care of their cars. But where does our story begin, and what inspired Douglas Holt to launch a car care brand 100 years ago? Our founder, Douglas Holt, always enjoyed tinkering with engines. During the First World War, he worked with the Austin Motor Company, where he learnt the ins and outs of taking care of engines and car parts. After the war, Douglas began creating products to fix problems that motorists faced during everyday driving, and later opened a shop selling car parts, accessories and products to make day-to-day driving and maintenance simple for everyone. He believed that drivers should be able to solve car problems themselves at home, so developed inexpensive, easy to use products. In the early years of Holts, Douglas took a lot of inspiration from the American motor industry, taking technological innovations from the other side of the pond and applying them to his own maintenance products. One of Douglas’ earliest successes was Wondarweld, a heavy-duty leak repair product designed to seal leaks in car engines. Douglas recognised that many cars were suffering cracked cylinder heads because drivers didn’t use antifreeze, and so developed a product that could fix small cracks and holes easily – helping motorists save big on the cost of repair bills. Gun Gum was developed when Holts needed to repair his own car exhaust and couldn’t find anything suitable. The paste he developed was typically Holts – affordable and simple to use at home, and it’s still the UK’s leading exhaust repair today. 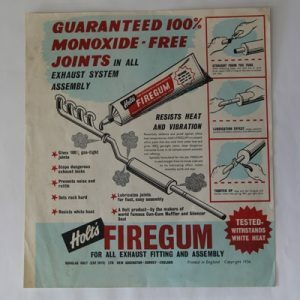 By the 1950s, Holts’ reputation for quality and innovation meant our products had found their way into the stores of major retailers like Halfords, and we expanded across Europe. 1964 was a big year in Holts’ history. We acquired Romac Ind Ltd, a small car maintenance brand that specialised in tyre repair and motor repair products. Thanks to this, we launched one of our most iconic and successful products, Tyreweld, an emergency puncture repair product that’s still helping motorists to get back on the road. Over the last few decades, we’ve enjoyed meeting the challenges of modern driving and we’ve worked hard to continuously develop and update our products so that they work on today’s cars. From emergency repair products like Tyreweld and Radweld to recent new products like our Headlight Restorer Kit, we still lead the way in car maintenance. And, despite decades of changes and innovation, we’ve always stayed true to the heritage of the original Douglas Holt brand – providing quality car maintenance products that solve problems, at an affordable price. Over the last 100 years, we’ve launched some truly innovative products designed to make life easier for drivers, whether they’ve suffered a puncture or need to repair a chip in the paint. Here are a few of our favourites that are still available today. 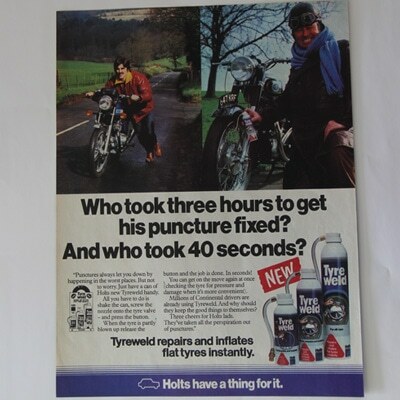 Since it was launched in 1964, our iconic puncture repair formula has been the go-to solution for motorists who don’t want to spend ages changing a wheel by the roadside – giving them a quick fix to get from A to B with minimum disruption to their journey. Spray and go – what could be simpler? Launched in 1991, Bradex Easy Start was yet another solution to a frustrating problem for drivers: a non-starting engine. The Holts development team set out to create a product that would make those cold-morning struggles a thing of the past, and this simple spray formula was the result. A strong name for a strong product; Holts Gun Gum is an innovative exhaust repair solution, allowing keen DIYers to fix small holes and cracks on their exhaust with a permanent, gas-tight seal. Today, Gun Gum is one of our most popular products, and we’ve reformulated our products and range over the years to make sure it’s compatible with all different types of exhaust systems. We’ve also developed a range of bandages and wraps to give even better performance and ensure a permanent, gas-tight seal in all areas of the exhaust system. One hundred years on and we’re still focused on solving motoring problems, using the latest technology to create simple and affordable car maintenance products that keep drivers moving. With a dedicated lab team, we continue to invest in research and development – creating products designed for modern driving. As well as working to improve our formulas and develop new products in 2019 and beyond, we’re doing other things to make life easier for our customers. Our blog is fast becoming the go-to resource for car maintenance help and advice, with hundreds of simple guides on maintaining different aspects of your car. This year we’re excited to announce that we’re working with Wigan Warriors as their Official Repair and Maintenance Partner. We’re working with their medical team as they repair and maintain the rugby players to get them back on the pitch. There’ll be updates, interviews and chances to win so make sure you follow the updates here. We’ve got more exciting plans in the pipeline too to celebrate this big year, with chances for you to get involved, and you can follow all the action via Facebook or Twitter. For 100 years, Holts has been helping your car to keep on running, and now we’re looking ahead to the next 100 years. For more information or to browse our products, visit the homepage today.